CNWX 11991 Snow Plow: Windmill Edition. Armstrong, IA. Never have I been so happy to be wearing warm boots in Iowa. I believe this was featured in the No. 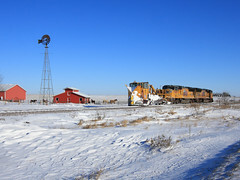 26 2011 issue of Railroad Heritage.